On 2:30 AM on Labor Day the birth of my second baby started. I woke up with bloody show and immediately went to google “how soon after bloody show does birth start?” Before I read the first response, I felt my first pressure wave. I was really excited but not totally sure. I was 9 days passed my guess date and didn’t want to get my hopes up. My husband had guessed he would be coming on that day because it would be a pun for “labor” on Labor Day. After a few more waves, I sent a text to my birth team, put on my Hypnobabies Birthing Day Affirmations and tried to get back to sleep. 2 hours later I realized I wasn’t going back to bed. I woke up my husband and asked him to make sure our car was charged, just in case, because it might be the day. Then I got ready for the day, pausing for each wave and easily Peeeeace’ing my way through them. My waves were about 30 seconds long every 2 minutes. I had scheduled to see my midwife at 9 am so she came over and we did our prenatal appointment. She said the baby was definitely coming today, but since my birthing waves slowed down when she got there, she was going to leave and I should call when things felt “different”. Evelyn, my 2 year old daughter, was up a little after that, so we went downstairs to watch a movie like I had always pictured during my Visualize Your Birth track. I had my Hypnobabies Your Birthing Day Begins on in my headphones while she watched and we cuddled. My sister brought over breakfast and then my mom got Evelyn ready to go to my sisters. When the house emptied out, things intensified. Waves were still 30 seconds long every 2 minutes but were getting more powerful. My husband would put his hand on my shoulder and use the “Relax” cue we learned in Hypnobabies during each one. We joked and laughed between waves. We went upstairs and I took a shower. I listened to Hypnobabies Easy First Stage on a waterproof speaker while taking a shower in center switch. After the shower my husband suggested we call the midwife. I was unsure, not wanting to call too soon, but agreed. When she arrived I asked for a cervical check. She said it was 5cm and the baby was coming soon and we could set up the pool. I still couldn’t believe it! We were still laughing and joking! My previous birth was very long and I couldn’t believe it was happening today! The birth pool was too hot, so I got in my bath tub. My husband read birth prompts from the Birth Partner Guide. He asked if he should switch to the transformation prompts but I said no. I had no idea things were progressing so wonderfully and I actually was in transformation! My hypno-doula (and Hypnobabies instructor) Carrie Cesario Mendes showed up just after that at the perfect time! Transformation was in full effect and I loved having the kind of support that only a professional hypno-doula can provide. I would take her hand as each wave came on and she would guide me through it, reminding me that the power was me and each wave was coming in and going out bringing me closer to meeting my baby. With every wave she would begin “Okay here we go…” and I’d relax into my Special Safe Place. My photographer showed up around the same time. She said hello quickly and quietly and then disappeared into the background for the remainder of the birth, while still capturing every important moment. When my bath tub got cool, we moved to the birth pool. After a few waves in the pool, my body suddenly started pushing. My midwife heard my sounds changing and came in the room to check. I told my sister (who is pregnant for the first time and was present for both of my births) that the sound I was making was just coming out and I wasn’t in pain. There was a cervical lip so we got out of the tub to do a different position. My midwife held the lip through a few waves and then the urge to push was uncontrollable and he was on his way out! I kept asking if I was “allowed” to push, which was a remnant from my last birth. 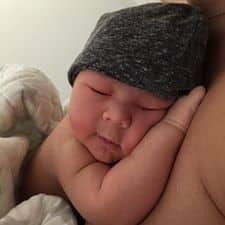 My midwife calmly assured me to just follow my body. She said I could go back in the birth pool but I could feel him moving into the birth canals and there was no way I was moving. My water broke and there was laughter and baby Cole wasn’t far behind. He peeked around and smiled on his way out. Cole arrived 12 hours after I woke up and just a couple of hours after the birth team arrived! This birth was filled with so many smiles and so much joy! When a friend recently asked what was the difference between this birth and the last, I told her this time I trusted the Hypnobabies program from the start and leaned on it entirely instead of trying to willpower through it. It’s been three days and I feel fantastic. Cole is such a sweet spirit! He already smiles a lot and has brought our family of 4 so much happiness. ? ?